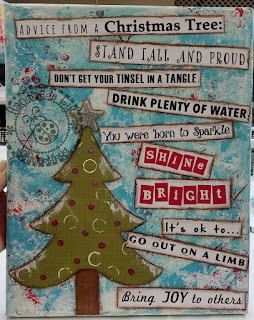 I have often looked at Mixed Media projects and thought some of them were really cool looking and my LSS, Scraptopia, has classes quite often and my friend Linda H. asked if I wanted to go to the Advice From A Christmas Tree class and I told her I thought it sounded like fun. I was suppose to do another class one time with her but what I had pictured in my head was something totally different than what they did and when I saw what she made I was upset I didn't go. Anyway, last night I made it to the class and not only did I have a great time and meet some new people but I also made a really cool Mixed Media project! I am not sure where Trina came up with the idea for this project but I just love it! I always thought Mixed Media projects looked complicated but I guess it's all in the techniques that make it look complicated. I always wondered how they got the textured look on the canvas and was surprised it was just crinkled tissue paper, not to be confused with toilet tissue paper of course, and Modge Podge. 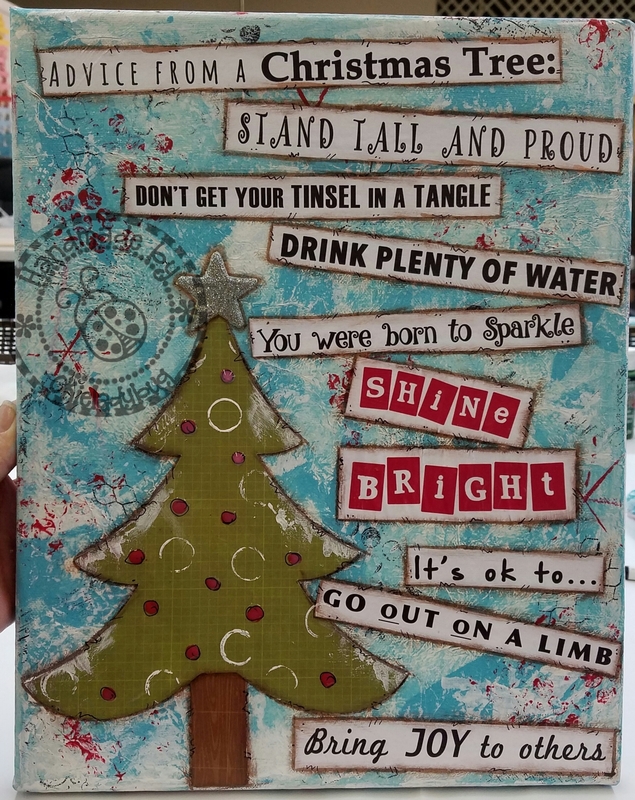 We did stamping on the canvas as well with a variety of stamps and I was nervous about the stamp not being a full stamped image but Trina assured us that it wasn't suppose to be *okie remembers how she had to take a deep breath on that one and just go with the flow*. Now as we all know, or most everyone knows I am all about inking edges and to get the brown ink around the elements we used a brown Tombow, I believe it was, marker and then we either used our fingers or a Q-tip to smear the marker ink. I used my finger and it may never come off but who cares since I have a cute canvas now. In the picture you might notice some of the red dots on the tree look foggy, well that was because I took a picture before the glossy accents had fully dried. I still have to go over the whole thing with a coat of Modge Podge but since I have some of that gluey goodness at home I knew I could finish it up later instead of waiting at the scrapbook store and allowing it to dry and then applying the final coat. I'm so glad my friend Linda H. asked me to go and I can't wait for the next class which is going to be Advice From A Snowman. We won't be doing that one until after Christmas but that's okay and I think I might have my daughter go with me to that one. Sometime ago I bought some packs of canvas, because I am sure I got them at a good price, and I can't wait to maybe do some with Santa Claus themes since that is what I love to decorate with at Christmas time. After all, I still have 9 days before Christmas! OMGosh, this canvas is so cute Shirely! I love it!!! I learned a few months back that we all use mixed media and don't even know we do it. lol Mixed media always scared me too because it looked so complicated, so when I found out it wasn't I was cool with it. Your canvas turned out so well, can't wait to see what you make with a snowman and santa! I love this! I want to take a class too. Cant wait to see more.